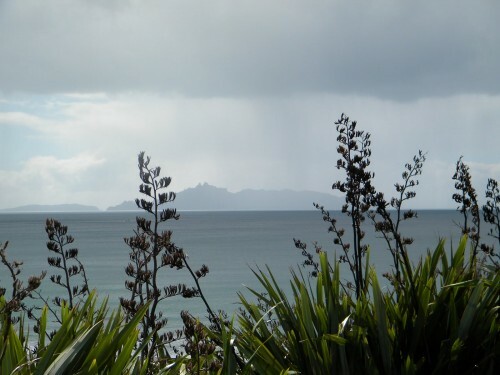 The furthest north that we traveled was to Mangawhai Heads, looking out toward the Hen and Chicken Islands. Wild flax was abundant along the coastline. 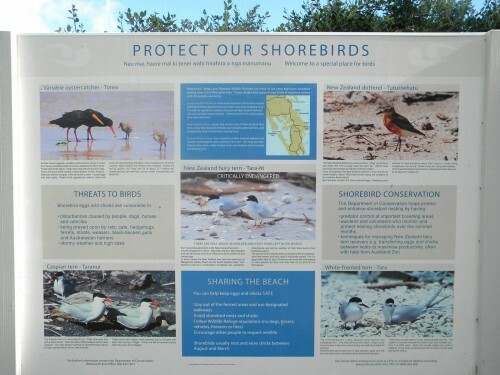 With a beautiful sandy beach to the south, a protected preserve for shorebirds, inaccessible except for access from the south and by boat. We could look but not touch. 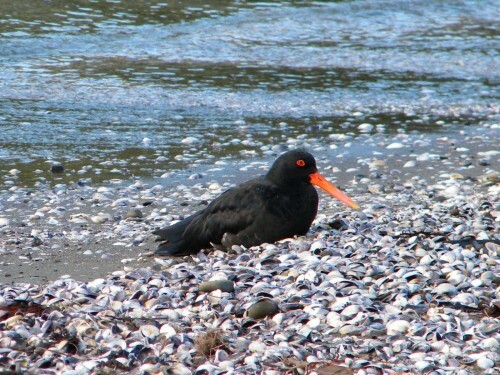 Another stop on that day was Pakiri Beach, where our birding tour will visit in November 2011. One of the species we will seek on that trip is the Fairy Tern. 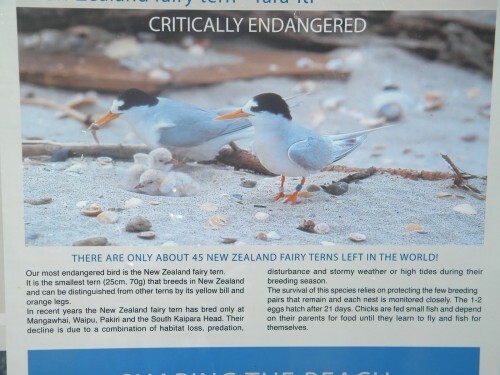 With a population of around 45 individuals that includes approximately 12 breeding pairs, the New Zealand Fairy Tern is probably New Zealand’s most endangered indigenous breeding bird.It is ranked as an endangered species, and carries a ‘Category A’ priority for conservation action. A Department of Conservation Recovery Plan is currently in action. 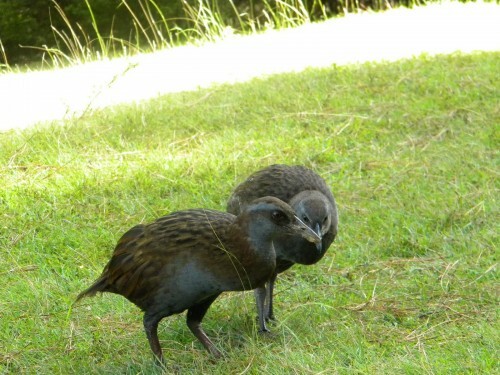 We found a family of Weka, a flightless member of the rail family. 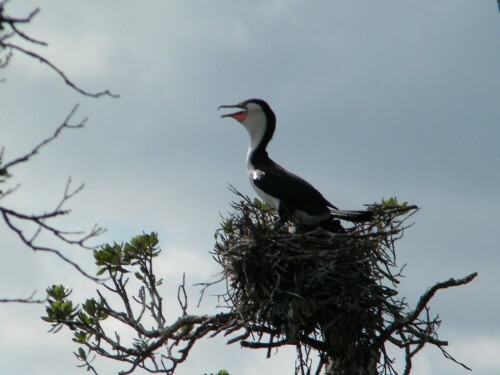 Both parents and two young were present, allowing close up views. 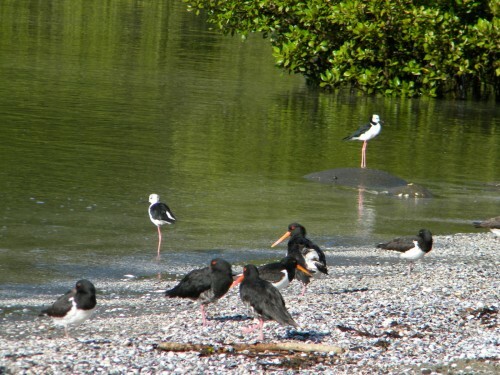 Kawau Island website includes some information on the species of birds that are found there. 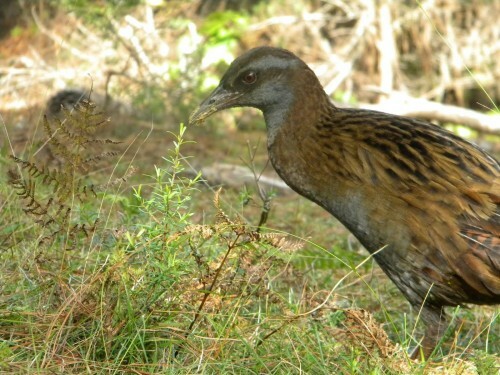 Eight species of rails, gallinules and coots breed in New Zealand. 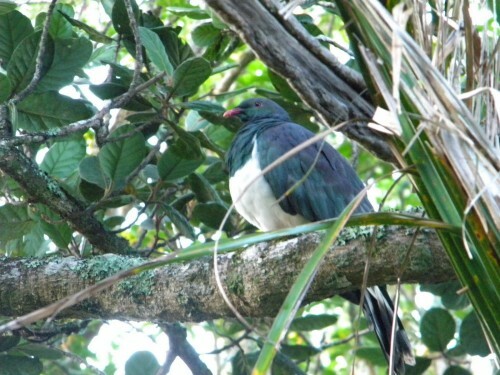 Evidence shows that 8 other species have become extinct between the arrival of the Maori and European settlement. 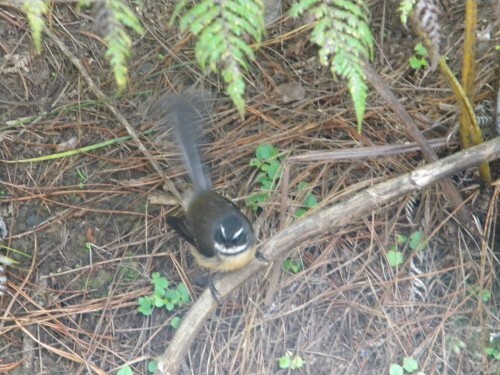 This North Island Fantail was remarkably cooperative for a tiny bird that spends its life flitting around in search of insects. The Fantail is one of the few forest birds that has benefited from the large scale clearing of forest and the creation of scrub habitat. 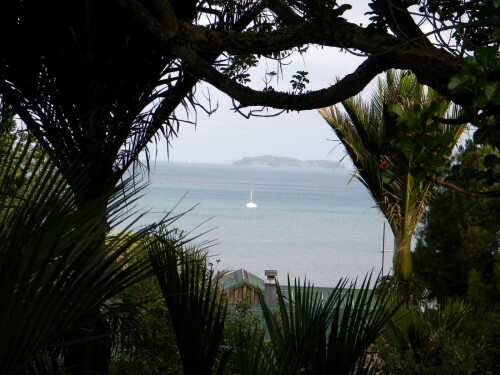 In 1862 Kawau Island was purchased by one of New Zealand’s first governors, Sir George Grey, as a private residence. 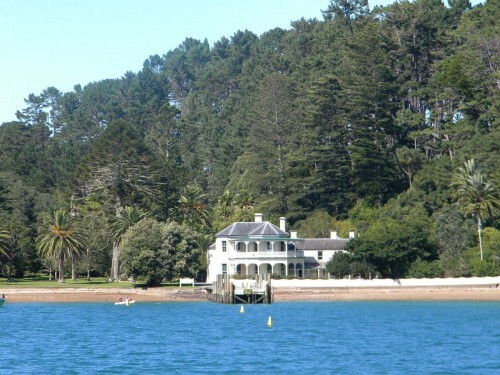 He employed architects to significantly extend the mine manager’s house to create the stately mansion that still stands today, fully restored in its sheltered sunny bay. In the valley behind the house, the governor created an extensive garden containing plants and animals from all over the world. In the valley behind the house, the governor created an extensive garden containing plants and animals from all over the world. 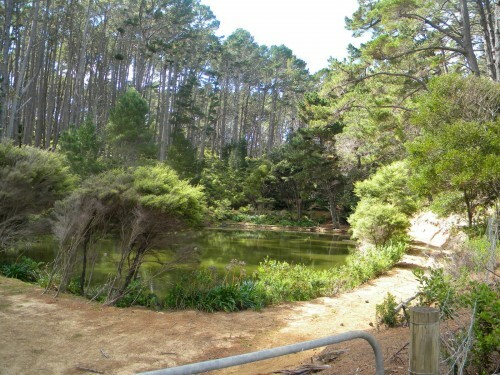 It is here that we walked among the expansive gardens, seeing many species of birds, but no kiwi since it was daytime. Among the many animals on the island are several species of wallaby, one of which is now extirpated from its native habitat in Australia. 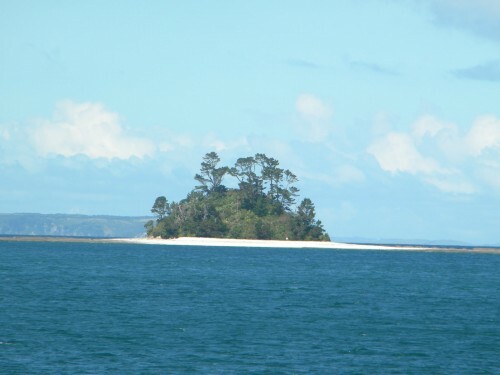 So, this is not Kawau Island! But, it looks just like an island one might be shipwrecked on. Very small and would probably not support even one person. We took the mail boat to the island traveling to different locations and dropping off and picking up mail. 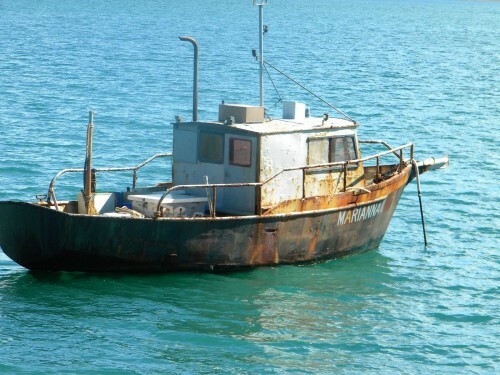 This is not the mail ferry! 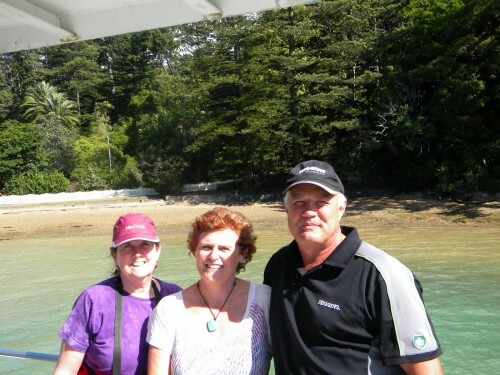 Kawau Island was originally settled by early migrations of Maori people. From time to time tribes contested for the right to live on the island, which was eventually abandoned in the 1820s after a particularly bloody skirmish during the musket wars. 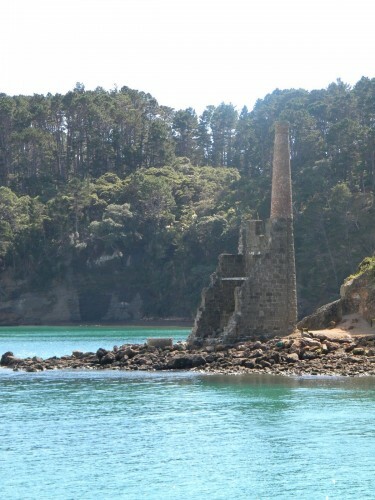 A manganese mine was established on the island in the 1840s; shortly after, copper was discovered by accident. Fascinating ruins of the underground seashore copper mine, a pumping engine house and a small smelter remain today. My friends, Marion and Kerry Manson! Gorgeous weather that day! 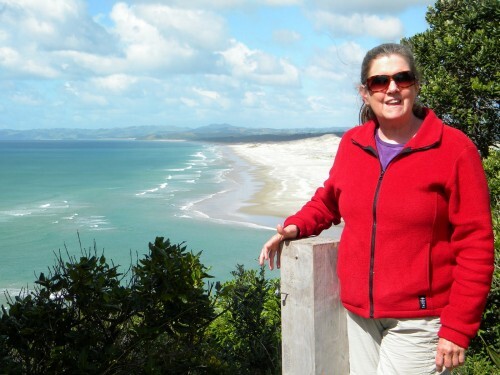 Hi from New Zealand. I’m having a wonderful time with an awesome group of quilters. Internet access hasn’t been as good as I’d hoped, so it’s been challenging to share my trip with you. But here’s a glimpse of what I’ve been up to so far. 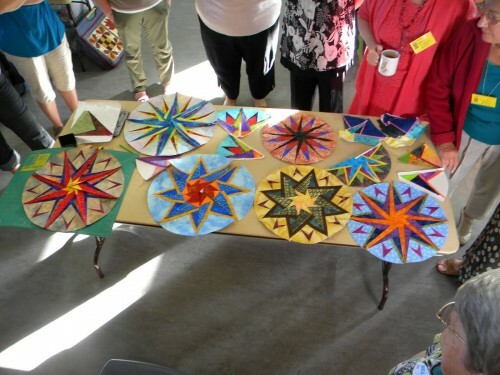 Leg one of my trip began with classes for the POP Quilters and the Auckland Patchworkers Guild. Above are just a few of the stars designed on day one of a 2-day class. 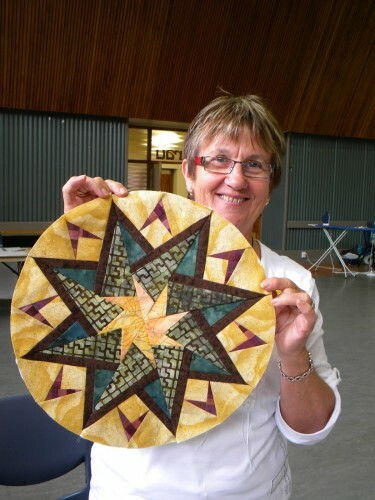 After completing her original designed star, Wendy Johnson decided to work on a manageable-size project during day 2. 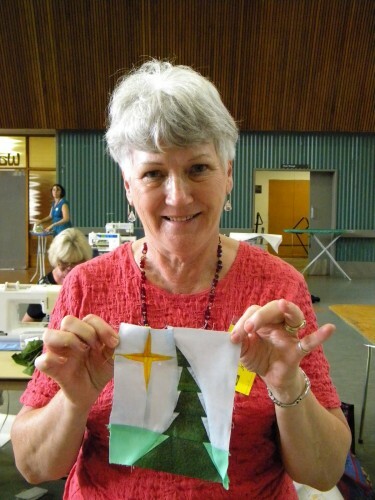 She designed this cute little tree and star that she plans to use as a quilted Christmas Card. 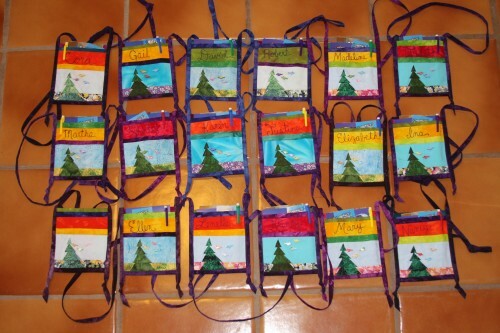 By the time she arrived at guild meeting the following day, it was quilted and bound. 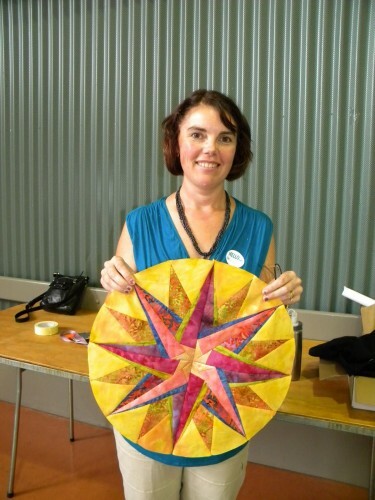 Nicola Graham was working on a sunburst that would become part of a much larger design. In her other life, Nicola designs wedding gowns and formal wear. Marney Lyons designed this terrific star, using a unique print that really accentuates the overall design. All of the students were “stars”!!! Now the quilt and textile tour part of my trip has begun. We are having a blast! I’ll be sharing more of the trip with you soon. Does it sometimes seem like everyone you know is having a baby or grandbaby at the same time? That’s happened to me lately! And of course I don’t have any extra baby quilts on hand for gifts. 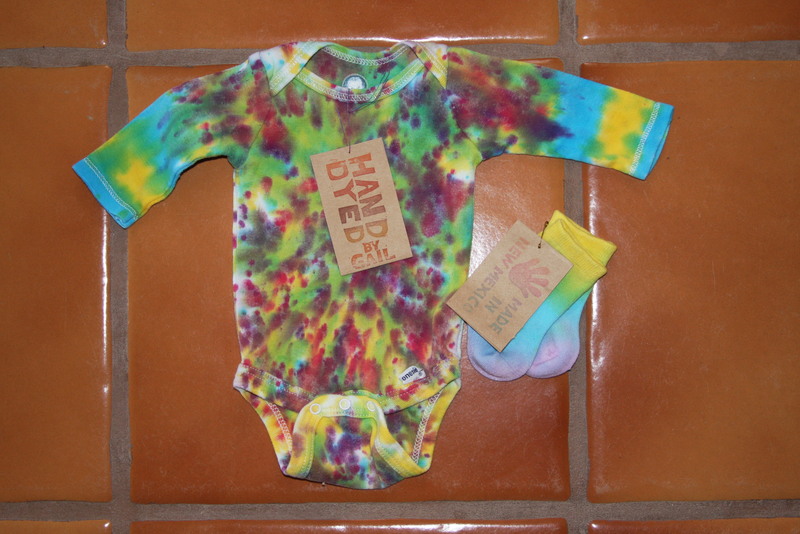 So I ordered some tiny white baby socks and onesies from Dharma Trading Company and dyed them to match. 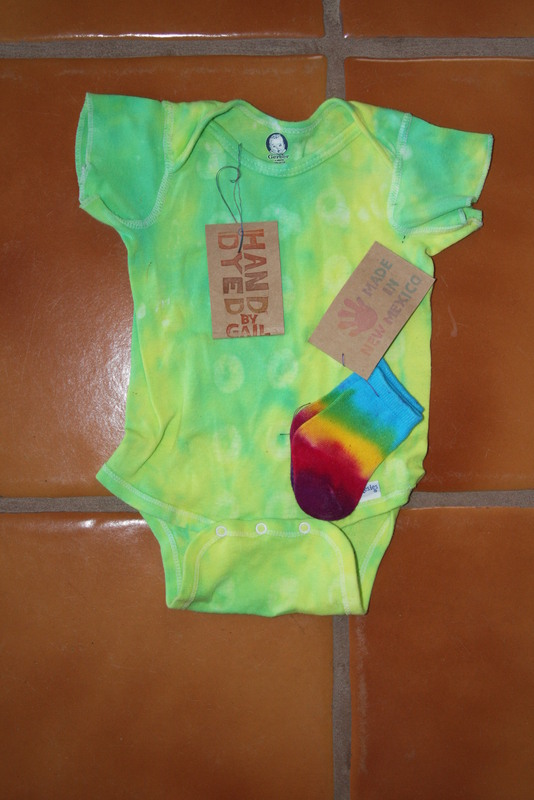 I think they are very cute and they will look even cuter when they are worn by a baby.